once described her as a "national institution." This was high praise during a time when women were expected to remain in the background and be seen but not heard. In 1783 after the Revolutionary War (1775–83), in which the American colonies fought for independence from British rule, her parents made the decision to sell their plantation. They freed their slaves and moved the family north when Dolley was fifteen years old. Her father used the money made from selling the plantation to set up a business in Philadelphia, Pennsylvania. When Dolley was nineteen years old, the representatives to the Constitutional Convention (May 25–September 17, 1787) gathered in Philadelphia. Many important representatives attended the convention, which resulted in the creation of the U.S. Constitution. George Washington (1732–1799), Alexander Hamilton (1755–1804), and Benjamin Franklin (1706–1790) were among those who attended the convention. At this time Dolley saw for the first time a Virginian named James Madison, who was later called the "Father of the Constitution." Dolley Payne grew into a beautiful and popular woman. At the age of twenty-one she met John Todd, a lawyer, and the two were married in January 1790. The couple eventually had two sons. Then, in August 1793, an outbreak of yellow fever (a deadly disease that is spread by mosquitoes) occurred. A great number of people died, including Dolley's husband and her youngest son. Although she also became ill, she eventually recovered after a long, slow fight. In the spring of 1794 James Madison requested a meeting with Dolley Payne Todd. Madison was an extremely ambitious man who was well known in Philadelphia. He helped draft the Constitution, the document that represents the basic laws on which America is founded. He also was responsible for suggesting the Bill of Rights, the first ten constitutional amendments that safeguard an individual's civil freedoms. Within a few weeks after the two met, it was widely rumored that they were engaged. Although she denied this rumor, it proved to be true, as Dolley Payne Todd and James Madison were married in September 1794. Over the next several years, Dolley and James observed and at times were directly involved in some of the most important events in the history of the United States. In 1797 they saw John Adams inaugurated as president. In 1801 Thomas Jefferson began the first of his two terms as president. At that time, James Madison was made secretary of state. In 1803 the United States bought the Louisiana Territory from France. As a result of this purchase (the Louisiana Purchase), the United States had suddenly doubled in size. When Jefferson decided not to run for a third term, James Madison was elected president of the United States. Madison began his first term in 1809, and Dolley Madison became the first lady. Some say she took on the job as if she had been born to fill it. She was widely known for her caring and loving nature, her fashion sense, and her graceful manners. In 1812 James Madison was reelected and the War of 1812 (1812–14) began. The war was fought between Great Britain and the United States over Britain's disregard for American neutrality and their practice of boarding American ships and forcing sailors to join the British navy. On August 24, 1814, British troops moved into Washington, D.C., and Dolley Madison was told that she should leave the city. She made certain that she saved her husband's important papers, the silver, and a portrait of George Washington. Madison narrowly escaped the British, who burned the Capitol Building and set fire to the President's House. In the following years, Madison witnessed the end of the war and James Monroe's inauguration as president. After leaving office, the Madisons moved to Montpelier, Virginia. They found peace in Virginia during their retirement years. They spent their time improving James's beloved home, where Dolley Madison would remain for the next twenty years. James Madison died in 1836. He willed his papers to Dolley Madison so that she could make some money by having them published. The Madison papers were James's writings on the many years of significant historical events. After her husband's death, Dolley Madison moved back to Washington, D.C. She then sold some of her late husband's papers to Congress and received $30,000 for them. In the remaining years of Madison's life, she would see four different presidents enter office, the rest of the Madison papers sold to Congress, the laying of the first stone for the Washington Monument, and the introduction of the first telegraph (an early communication system). She had led a full, active, and productive life. 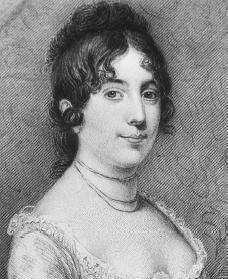 On July 12, 1849, Dolley Madison died in Washington, D.C.
Davidson, Mary R. Dolly Madison: Famous First Lady. Champaign, IL: Garrard, 1966. Reprint, New York: Chelsea Juniors, 1992. Flanagan, Alice K. Dolley Payne Todd Madison, 1768–1849. New York: Children's Press, 1997. Gerson, Noel B. The Velvet Glove, A Life of Dolly Madison. Nashville, TN: T. Nelson, 1975. Moore, Virginia. The Madisons: A Biography. McGraw Hill, 1979. Pflueger, Lynda. Dolley Madison: Courageous First Lady. Springfield, NJ: Enslow, 1999. You should add more about james madison leaving dolley madison in the whitehouse. What did his note say? I enjoyed this information, and it was very helpful to me. Nice work! This biography has helped me out alot with my families heritage. In fact, Dolley Madison happens to be one of our great ancestors. She was a great figure in American history and we will always remember her as an amazing woman and a figure of our lives.